Ultraportable notebooks have been all the rage in the tech industry since 2010. Apple used to lead the way. The MacBook Air practically redefined what a portable and light notebook should look like and how it should operate. Then, the 13-inch MacBook Pro redefined the ultraportable concept again with its Retina screen and powerful internals. In 2015, Apple tried to one-up itself with the 12-inch MacBook, which was supposed to be like a MacBook Air on steroids, but lacked the processing power to be as useful. Thanks to the arrival of Windows 10, PC ultrabooks are back in the game. Some have better screens and more power than any of Apple's small and light devices. First, there's the Surface Pro 4, which is the best laptop/tablet hybrid in existence. Then, there is the bezel-less Dell XPS 13, which is a high-powered laptop containing a 13-inch screen that fits into the chases of notebooks usually reserved for 12-inch screens. These laptops use Intel's new Skylake processors, which improve performance while (supposedly) saving battery life. The most effective versions of these ultrabooks are the ones with the Quad HD+ resolution screens and the Intel Core i7 processors. If you own the Surface Pro 4, you understand where the "supposedly" comes from when talking about battery life. Razer, a company known for making gaming laptops, has shocked the industry by producing the most beautiful and - perhaps - best functioning ultraportable laptop today. 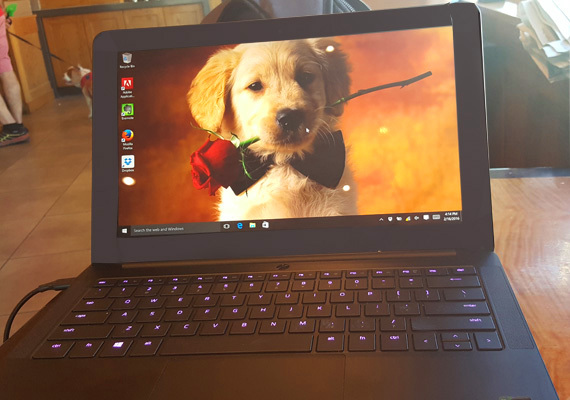 The Razer Blade Stealth first made mouths water and brains fry at CES and now, this dream-come-true ultraportable is available for purchase at the Microsoft Store, although it hasn't shown up on their website yet. For the purposes of this article, the $1399 version with a 4K screen, 8GB of RAM, 256SSD, and Intel Core i7 processor will be discussed. For those who want to save money and don't need all the bells and whistles, there is a cheaper version for $999. The first thing you will notice when looking at the 12.5-inch 4K screen is that it seems to be looking at you rather than the other way around. The images are crisp, beautiful, and display 100 percent of the Adobe RGB color spectrum. Then, you will notice what may be the only majorly disappointing aspect of the Steath - the huge bezel space. You would think that a 13.3-inch screen could have been fit into the device. However, it's obvious that compromises were made and they are worth it. One of the reasons the bezels are so big is so Razer could fit two large speakers below them at the sides of the keyboard. These are the best sounding speakers on an ultraportable right now, even though they could use more bass. Laptops with thinner bezels put speakers in the rear or underneath the laptop, taking away from the multimedia experience. Usually, ultraportables make compromises when it comes to fitting a keyboard on a small device. However, the same thing can't be said about the Razer Blade Stealth, which has an almost perfect keyboard. One may find the keys a little shallow at first, but they have just enough travel and are easy to get used to. The Stealth provides an individually RGB backlit keyboard that can be programmed. The user can program every single key to light up in any color you like. You can even program animated patters into the keys. The Stealth is sold as a gaming laptop. However, there is just a little catch: You have to buy the Razer Core dock that supports just about every desktop graphics card available. So, after a day's worth of word processing, photo editing, and video editing (all which the Stealth does well thanks to its strong processor), you can come home and attach the Stealth to the Razer Core and play games with intensely heavy graphics. You can play some games without the Razer Core, but the battery life will be depleted before you know it. Speaking of battery life, don't expect a lot with a device that has a 4K screen and is so incredibly thin. With the Stealth set at 75 percent brightness and cycling through word processing, photo editing, Netflix viewing, etc., I was able to get almost four hours of use. Some non-users may be able to pull a little over five hours with the Stealth. In other words, don't forget the charger, which, by the way, is a USB-C one. Unfortunately, the USB-C port is a little loose and the charger lost its connection a couple times for me over the past two days. It's not a deal breaker, but one has to charge it in environment where the cord can't accidentally be pulled. After two days of full use, I can proudly say that the Razer Blade Stealth is the greatest ultraportable laptop that has ever been put out on the market and this is coming from someone who has spent a lot of time with just about every one of them. The Stealth is a device that you have to see to believe. The higher-end version of the Stealth is quite expensive, but it is also completely worth the price. Apple, Microsoft, and other ultraportable notebook makers will now have to completely up their game.